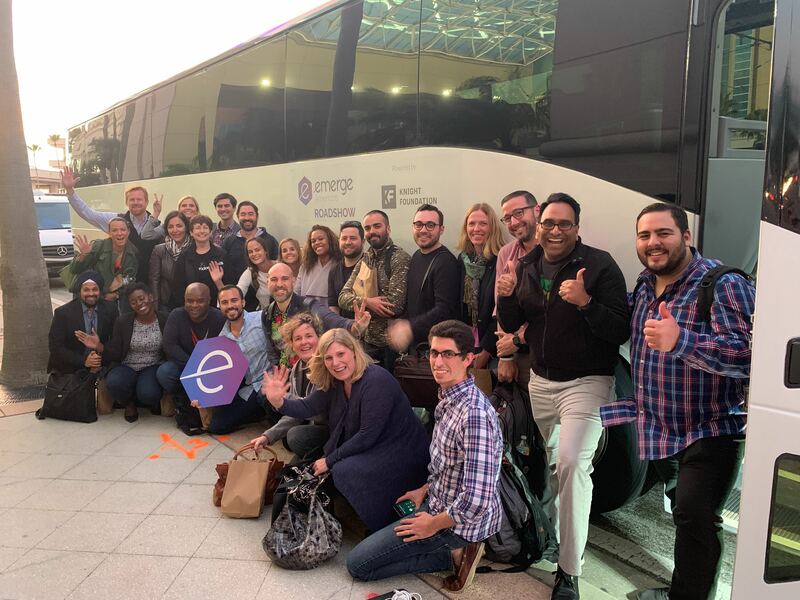 About 30 South Florida entrepreneurs and organization leaders boarded a bus for Tampa, in order to spend two days participating in Tampa’s Synapse Summit, a two-day community-focused startup and tech conference. Raul Maos, Melissa Medina, Ana Paula Gonzalez, Pandwe Gibson, Joe Russo, Tony Jimenez, Saif Ishoof, Carlos Penzini and others also participated in talks and panel discussions and judged pitch competitions at the summit, attended by about 5,500. Omar Khan, chief product officer at Magic Leap, was a keynote presenter as he told the story of Magic Leap, now 1,600 employees strong across 18 offices globally, and its Magic Leap One (the demo area was a very hot ticket at the summit). And Miami’s last-mile mobility startup SunVessel won the grand prize in Synapse’s startup competition (more on that in a future post. The group road trip was sponsored by eMerge Americas and the Knight Foundation. The objective of the eMerge Americas Roadshow was to connect the Miami and Tampa tech ecosystems as part of a macro goal of making Florida not only the “Sunshine State” but also the “Startup State,” said Felice Gorodo, CEO of eMerge. During the 4+ hour bus ride, the group discussed how they will uphold their part in nurturing the statewide startup environment, in addition to continuing to nurture Greater Miami’s ecosystem and its Latin American gateway role. Also this week, FIU’s Miami Future Urban Initiative came out with a report looking at South Florida’s ecosystem more deeply (more on that in this post). But first, here are a few facts about other startup ecosystems around the state you might not know about, shared at the conference, which included more than 300 exhibitors and 80+ mainstage talks and breakout sessions. In a breakout session on the Startup Genome Report on Tampa, we learned that Tampa has pretty much the same challenges as Miami, but at an earlier stage. The data show there is still a large gap in early stage funding (sound familiar?) and while exits are increasing, the region needs more large ones (sound familiar?). The report, which compared the Tampa metro to other startup ecosystems around the world that it studied (not Miami yet, but that’s coming), put Tampa in the “activation phase,” the first stage of startup community growth. Lakshmi Shenoy, CEO of Embarc Collective, a new startup hub in Tampa Bay, said that her organization has scrubbed all the data and found that there are more than 300 active startups in that region. Compared to other communities, Tampa has a strong share of engineering talent among its ranks, but those engineers are not necessarily powering startups yet as they do in similar communities. The report noted particular areas of growth and opportunity were in healthtech and adtech. The area also needs more $100 million+ exits. “The more $100 million exits we have, the more high-growth companies we have, and that will attract more resources,” said Shenoy, who presented findings of the report. Did you know Tampa houses the Florida Israel Business Accelerator? Yep, the two-year-old accelerator has launched a couple of cohorts, and Executive Director Rachel Feinman said that about a third of them have already established offices and/or partnerships in Tampa Bay, including Econcrete, an innovative concrete for urban areas that’s better for the environment and marine habitat. And as of Wednesday, another startup-focused media site launched. Called Tampa Bay Inno, it joins about 11 other city publications around the country. Orlando, the land of Mickey and friends, is also home to UCF, a university founded to support the space industry. It has done so, with some of the most prominent technology programs in the country. Did you know UCF is the only college for photonics and optics tech? As a result, Central Florida holds the largest talent base for that in the country. The region has the most advanced autonomous technology programing and test sites in the state, and one Orlando-based company, Luminar, is a leader in creating the eyes in autonomous driving tech. It wants to be known as one of the smart sensor capitals of the country, and it’s why it formed BRIDG, a smart sensor research consortium in Osceola County. Synapse launched a new digital initiative called Synapse Connect, aimed at connecting the state’s resources and improving accessibility. So if you want to know more about the Sunshine, I mean Startup, State, head to app.synapsefl.com. It’s a work in progress, but the organization hopes that it will serve as an information and connection point for anyone thinking about launching a startup, seeking tech employment or learning about resources available in the state. “We’ve built it to become the digital guide to Florida’s innovation communities. This is a big idea and it is absolutely necessary if we are to achieve our potential,” said Marc Blumenthal, co-founder of Synapse. Florida is the world’s 14th largest economy and it is home to 150 colleges and universities supporting 1.3 million students. “Can you imagine what happens if our major urban areas collaborate with each other?” Blumenthal asked. 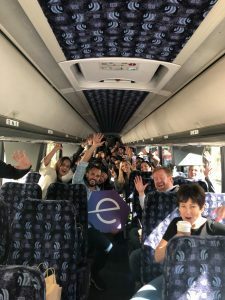 Just as eMerge and Knight brought a busload to Synapse, Synapse vowed to bring a contingent to eMerge Americas April 29-30. Email Nancy at ndahlbergbiz@gmail.com and follow her on Twitter @ndahlberg. Email ndahlbergbiz@gmail.com and follow her on Twitter @ndahlberg.